5 light-up buttons teach colors, shapes, & counting! Blocks teach about objects, food, animals & more! 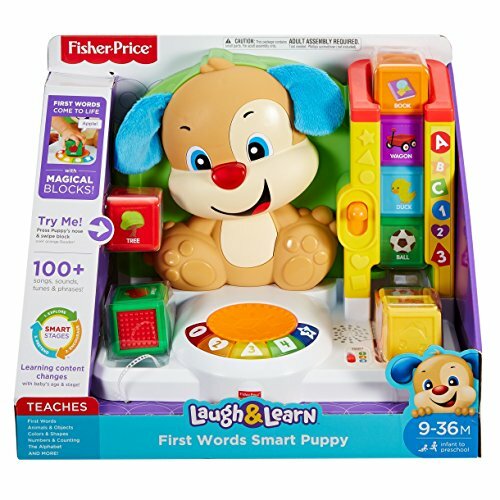 The Laugh & Learn First Words Smart Puppy teaches your little one first words with fun songs, sounds, phrases, and exciting hands-on activities! 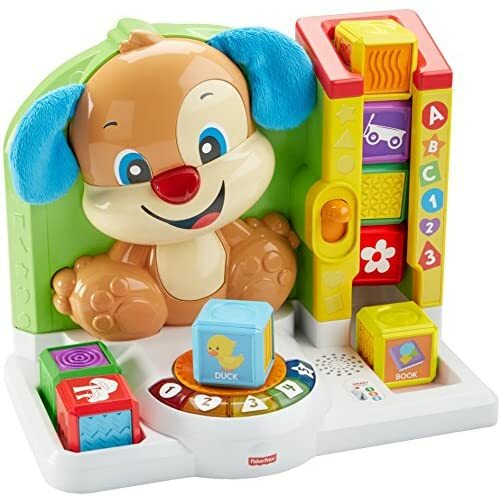 When babies swipe each block across Puppy's "magical" Reader, they'll hear sounds, phrases and more that introduce new words and objects from the big world around them. This helps build those important connections between the objects they see and the words they hear, which is what helps turn those first babbles into first words! 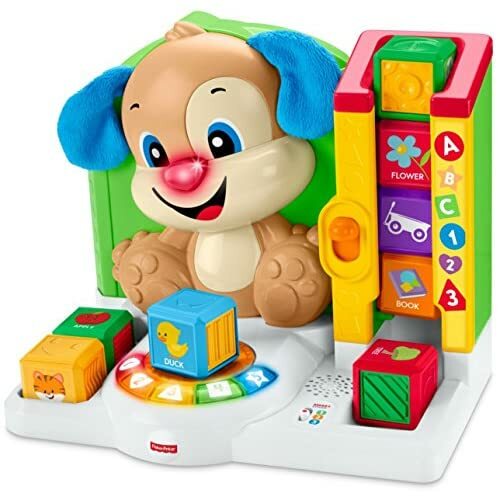 Little learners will have a blast pressing the lever to send the blocks tumbling down the chute and pressing Puppy's nose for playful music and lights. The learning continues as they press the five light-up buttons to hear songs and sounds about shapes, colors, and more! 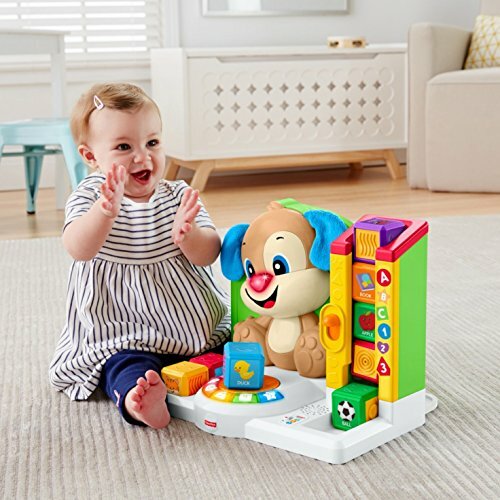 As your little one grows, you can level-up the Smart Stages technology to fit your baby's age and stage: Level 1: Explore – As babies explore all around, pressing buttons and swiping blocks on the Reader, they'll hear songs, phrases & more that help build important connections that lead to first words. 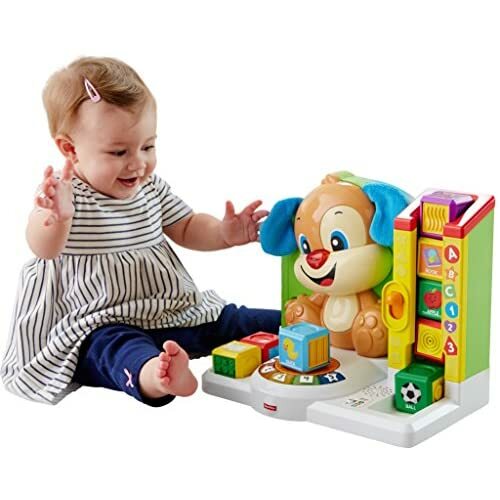 Level 2: Encourage – In this level, Puppy helps expand on little ones' vocabulary as they're prompted to find different numbers & shapes – with rewards when they do! Level 3: Pretend – This level lets your (little) big kid put those first words to use! 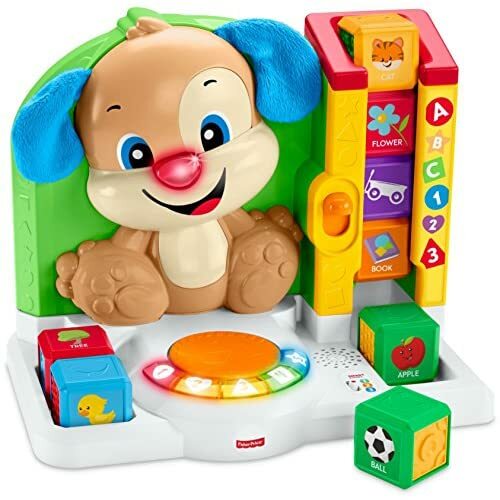 As they swipe each block across the Reader, they can imagine that they're off on different adventures with fun songs from Puppy!